Leap of Faith, the rousing gospel-tinged musical that follows the escapades of part-time reverend and full-time con artist Jonas Nightingale, is raising spirits at Broadway's St. James Theatre, where it opens on April 26. Read on to get the good word on a show that gives audiences something to believe in. As an executive with A&M Records, Janus Cercone spent years traveling with rock bands and became an expert at wielding the power of music and publicity to make a good impression: two things that faith healers prominent in the 1980s seemed to capitalize on. 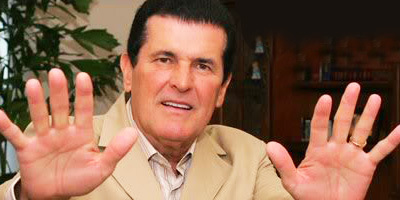 And at the center of it all was Peter Popoff (pictured above). Popoff was a famous televangelist, self-proclaimed prophet and faith healer who would routinely and accurately state the illnesses, home addresses and deep-rooted issues of those who came to hear him preach. His followers believed that this was due to his divine revelation and God-given ability, but Popoff’s only real talent was his ability to scam people by using a hidden microphone. His deceitful ways were eventually exposed on the medium that made him famous when professional magician and skeptic James Randi snuck a radio scanner into one of Popoff's revivals and publicly outed him on The Johnny Carson Show in 1986. After leaving A&M, Cercone signed up for a screenwriting class at the urging of her husband, producer Michael Manheim. Fascinated by Popoff (and others like him) and with the help of a longtime friend, magician Ricky Jay, Cercone wrote her first script about a tent revival preacher named Jonas Nightengale. Almost instantly, Leap of Faith was purchased by Paramount Pictures. Directed by Richard Pearce and produced by Manheim, Leap of Faith followed Jonas Nightengale, played by Steve Martin, a fraudulent faith healer and preacher traveling across America offering miracles—for a price. When his truck breaks down in Rustwater, Kansas, a town desperate for rain, Nightengale schemes to squeeze the town dry. His plan begins to unravel as his assistant, Jane Larson (Debra Winger), falls for Sheriff Will Braverman (Liam Neeson). When a local disabled boy believes Nightengale can make him walk again, the fake preacher struggles to find faith in himself. The film was completed and released in less than six months, an unheard of timetable in today’s world of big-budget blockbusters. Paramount’s only Christmas release, Leap of Faith opened on December 18, 1992, to mixed reviews. Despite a star-studded cast that included Lukas Haas, Meat Loaf, two-time Tony nominee Philip Seymour Hoffman and Tony winner LaChanze, the film was considered a box office disappointment, earning $23 million. "There might be a connection between evangelism and rock 'n' roll," Martin quipped, "you know, of motivating large groups of people to scream and faint." He wasn't the only one to see that connection. 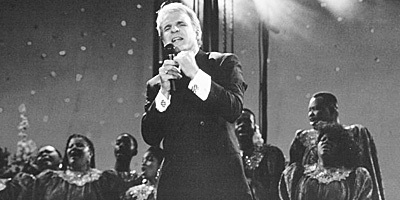 After bringing the music of Ray Charles to the big screen, director Taylor Hackford passed up the opportunity to transfer Ray to the stage, announcing on April 11, 2006, that he would make his stage directorial debut with Leap of Faith, featuring a score by eight-time Oscar winner Alan Menken, lyrics by Glenn Slater and a book by Cercone. "What got me here was Alan Menken's score and how it so beautifully fit the book," Hackford told Variety. After a development period of more than three years, however, Hackford departed the musical. A January 2010 workshop presentation featured four-time Tony nominee Raúl Esparza and Sutton Foster. Leap of Faith finally made it to the stage at Los Angeles' Ahmanson Theatre, opening on September 11, 2010, in a production directed and choreographed by Rob Ashford. 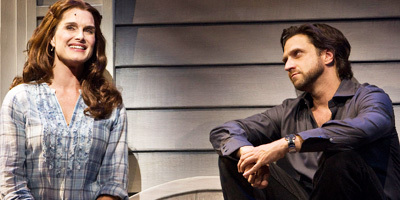 With Esparza as Jonas Nightingale (now spelled like the bird), the musical focused more on the budding romantic relationship between Jonas and Marva, a small-town waitress and single mother played by Brooke Shields. (Shields experienced her own crisis during previews when she broke her hand.) The L.A. reviews centered on Esparza's charismatic performance and strongly suggested that the show's 2:40 running time should be trimmed. Less than 24 hours after Leap of Faith closed on October 24, it was announced that the musical would head to the Great White Way. In yet another retooling, the show lost 40 minutes, largely due to a revised book by Tony winner Warren Leight (Side Man), and picked up a new director (Christopher Ashley), choreographer (Sergio Trujillo) and leading lady (Jessica Phillips). Shields went on to replace Bebe Neuwirth in The Addams Family and said in an interview that she “felt fenced [in] through the whole thing” in Leap of Faith. 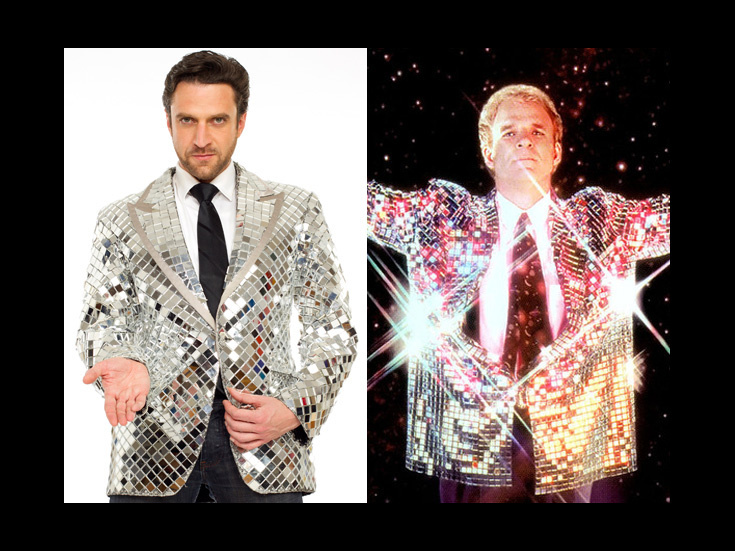 Raúl Esparza headlines this inspired new musical.